Thus began the interview with Jobst Brandt. Note that each of these 'sessions' are appended with some of his interesting writings that I found on the web. I have chosen them carefully not only to stay with the topic, but also to bring to light Brandt's wavelength of thinking that is very unique to him. Pictures : Standford University. Source. 1. We mostly know the man Jobst Brandt through online articles and a book, but what are the missing links in the story? Firstly, where were you born and was the bicycle a constant in your upbringing? JB : I was born in NY and moved to Palo Alto in 1938 when my father took a position at Stanford University. I have a BS in Engineering from the same. I started bicycling at age five and found it useful to go to school and to the community center and swimming pool that was more than a mile away. We even did outings to the yacht harbor, five miles away. I was gifted with big lungs and strong legs and so I enjoyed it. 2. What did you like about mechanical engineering that made you pursue it? Did you always feel math and science was your forte? JB : I suppose one is born with a preference for music, sculpture, or science in various forms. At preschool age I was always interested in how things worked... mechanically and otherwise. Electronics was not one of them. 3. 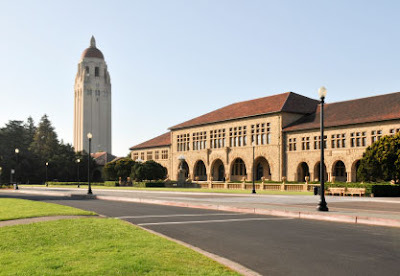 What were some of the most memorable things you did in your engineering classes at Stanford? Were you involved in extra-curricular activities and such outside classes? JB : Not much, my interests were in practical things. Railroads and steam engines were a large attraction for their mechanisms and how they worked. The same went for cars that needed much mechanical assistance in my youth. 4. I see. So tell me where this passion for the physics, mechanics and failure of bicycle parts come from anyway? JB : These are standard failure mechanisms of machinery that I watched with interest starting in my mother's kitchen and our cars and bicycles. 5. Do correct me if I'm off a bit here in reading you. Would you consider yourself frugal? Did you parents ever bring you up this way, cultivating in you the need to be conservative with finances or was it the engineering career that taught you that money and resources are limited, hence design must be based around that. JB : I think you are jumping to conclusions. As a youth I lived through the days of the second World War in which many things were scarce (due to the "War Effort") so we were careful about what was thrown away or repaired. I don't see a great frugality in my habits, I think they are more in line with not being a conspicuous consumer. I know many bicycle riders who are embarrassed to patch a tire tube because they don't want to be seen as poor people or cheapskates. 6. Have you ever considered teaching? JB : Yes and no. I seldom have time to develop a routine. Guest speaker is a better venue. 7. Would you kindly share a little about your professional background for my readers? I've read that you've had a stint at some big names such as Porsche, Stanford Linear Accelerator Center, HP, Avocet etc? How do you explain a famous bicycling personality working in all kinds of places, from premium sports car company to computers to particle physics before jumping into the bicycle industry? I mean, you must have picked up on a considerable wealth of knowledge from all these experiences. JB : I think you confuse bicycle technology with general engineering problems. Be that a cogwheel mountain railway or a sewing machine, failure occurs for the same reason, that of misunderstanding of the mechanical demands by the designer. My work at SLAC introduced me to computing and enabled me to develop cam shaft design programs as well as graphic display software that most people at SLAC and HP used. The wheel drawings in my book were drawn with my own software and along with that, I wrote the finite element program to analyze wheel deflections and spoke elongations. That program came from a pressure vessel analysis one of my colleagues wrote for his masters thesis at California Polytechnic State University, San Luis Obispo. 8. Remarkable! You're probably more than qualified to put forth an opinion here. As an engineer, what do you feel about the state of engineering these days? How do you compare engineered designs now to those in your times? JB : I believe it has always been poor in most places with singular exceptions, and those names certain engineers don't forget... like Leonardo, Tesla, and van der Waals, whose work is mainly misunderstood. Some people have heard of van der Waals forces but that's all. It involves, among other things, adhesives that are a mystery to most technical people. This gets close to tire patching and why patches won't stick. 9. Do you have any examples of poor engineering in our current atmosphere? JB : Toyota is a good example of bad technical management. Managers who manage technical people must understand the technology they expect from their people. Many of my managers recognized my understanding of machinery and assigned complex problems to me that others in the group did not master, be that in the US Army Corps of Engineers (weapons assembly, demolitions and bridge building), Porsche, SLAC, HP Frequency and time (Interferometers and optics), opto-isolators or memory disk friction and other mechanical problems. Those Toyota cars should never have gotten this far if the designs were reasonably reviewed and subjected to proper road tests. They weren't, probably under the belief that competitors were not operating any differently. This is a top management failure that reaches down to the lowest levels. I am dismayed at the press analysis of the whole affair, instead of recognizing it as bad technical management. Having seen such design problems I think I have a feeling for this. 10. To wrap up this session...you're probably retired now, is that correct? What do you do these days? JB : The work at HP ended and did not get renewed so I am on vacation full time. I ride the bike when I can and see how my friends are doing. I live alone and my sons live nearby, but even closer is my former wife. One of my brothers lives in London and keeps in touch by email. Jobst Brandt wrote the following in 2004 to the topic 'Learning To Ride A Bicycle'. "It seems to me children who don't easily learn to ride a bicycle may not be inspired by other children "on the block" who have already achieved this mobility and may not have seen their parents ride. My experience, both as a child watching siblings learn to ride in a single session, and as an adult doing the same with my children, makes me think that this is the case. Training wheels make an unstable tricycle of a bicycle, tricycles having been banished from our toy repertory for falling over when ridden too fast in curves. The method most commonly used by successful teachers is to hold onto the saddle such that the child cannot tell whether the parent is still holding on, or at least has the hand where it could help in the event of instability, while pedaling along. I have not seen this method fail with normal athletically inclined children in the 4-5 year old range. It seldom takes more than one session to get the child riding solo. Of course there must be a trusting child-parent relationship for the child to believe this is a reasonable endeavor." These are very interesting views although at times he doesn't answer to the point but no biggie. Thanks again! Thanks for doing this interview with Jobst. I have been reading his post and replies on post since the days when all we had were newsgroups.